First up I will be reviewing on a new skincare product that I have been testing for the past 2 weeks already. 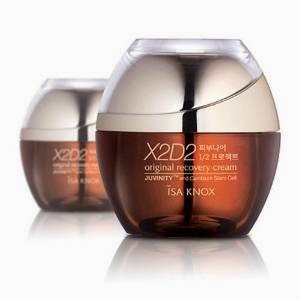 It is the Isa Knox X2D2 Original Recovery Cream. Isa Knox is actually a Korean skincare brand under LG Household & Healthcare and the face of Isa Knox is the beautiful Han Ga-In ! I bought this cream earlier this year but have yet to start on it until recently. It is essentially an anti-ageing cream that uses a type of plant stem renewal technology (Cambium Stem Cell) to nourish damaged ageing skin which is caused by various factors like stress , dust and exposure to sun overtime and also improve hydration. From the appearance it looks like a thick rich cream and I was a little apprehensive to start using it for fear that it will be too oily for my skin especially in this extreme temperatures in Singapore. That's why it has been left unopened for a while. But I was really glad I opened it finally 2 weeks ago ! This cream is actually lighter than I thought. It has a really smooth texture and absorbs even faster than the Hanyul Rich Effect Revitalising cream which I am quite impressed with. What I also like is that it has a mild floral scent as compared to some of the other creams that I own. I am not sure which of the products (the essence or cream) did a better job at the results above but this combination definitely works very well for my skin and I really hope it will last longer. Now I can do away with correcting bases and I just need a light layer of CC cream as my base make up routine ! I am really happy with the results and I would highly recommend this cream who wants to improve their overall skin complexion. However I am not sure if this is effective in reducing wrinkles and fine lines. Will have to monitor for the next couple of months to see if there are any results.